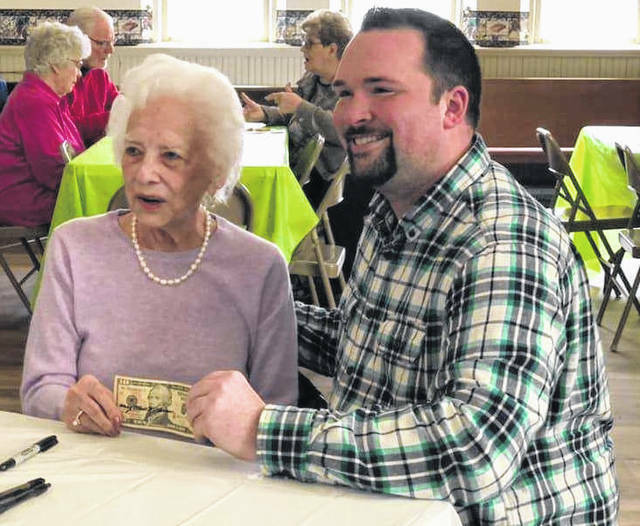 GALION — On Sunday, March 31, The Galion Historical Society was honored to host guest speaker and former United States Treasurer, Mary Ellen Withrow. Mary Ellen spoke of her time serving our country as the United States Treasurer from 1994-2001 under president Bill Clinton. During her tenure, the $5, $10, $20, $50, and $100 notes were redesigned and each bears her signature as treasurer. She currently holds the Guiness World Record for having the most currency with her signature on it, 1.1 trillion pieces. Mary Ellen shared that the 50-state qarter program was among one of her favorite things she was involved with as treasurer. The collectible quarters were a smash hit among collectors when they were introduced to the public and released periodically from 1999-2008. The federal government has profited nearly $3 billion from the project. The project remains the most popular commemorative coin program in U.S. history. Although Withrow is well known for being the U.S. Treasurer, her career in public service began long before her days in the White House when she was the first woman elected to the Elgin school board in Marion. She currently is the only person to hold the title of treasurer at all three local, state, and national levels. She was elected Marion County treasurer in 1976 and again in 1980. She served three terms as the Ohio State treasurer, elected in 1982, 1986, and 1990. During her visit, Mary Ellen shared many pictures of her time campaigning for county and state treasurer and shared several funny stories with the audience gathered at the Historic Grace Church. At the end of the presentation, The Galion Historical Society presented Mary Ellen with a gift basket filled with local Galion goodies and a membership to the historical society. Withrow resides in Marion where, in the Primrose Retirement Community. She has a museum containing her career memorabilia and artifacts. Appointments to visit her museum can be made by contacting Primrose Retirement Community of Marion at 740-251-4492. This article was submitted by the Galion Historical Society.